Oh, the drab days of November. I have always hated this month except for Thanksgiving. The trees look like little skeletal fingers reaching out and could look creepy, if one lets his imagination run wild. But there is excitement in the house. Dad and my brothers are excited for days before the first day of the month. Hunting season is coming and if you are any one at all, you have a rifle and the month of November is Thanksgiving and Christmas all rolled into one. I don’t know why I can’t get excited about it. We can sure use the meat and there is nothing like a good piece of deer meat when it is tender and fried just right, like only Ma can do. It is evening and there are at least three cars in the driveway. I sit over in the corner by the wood box while the men gather around the table with Dad to plan some strategy for getting a deer. I hear words like Overset Pond, Furlong Pond, up the Ames Road and cross over to Spruce Mountain. I have no idea where some of these places are, but it seems that they know the whole mountains like the back of their hands. At least, I know my Dad does and he is kind of the captain of this hunting team, I gather. Ma has a new glass percolator and Dad keeps going to the stove and getting it to top off the coffee mugs steaming there on the table. Smoke wafts off cigarettes burning down in ashtrays, so concentrated are the men studying the hand drawn map that Dad has laid out for them. There are those who will be drivers and those who will wait in certain positions for the deer to come by. Dad is showing more enthusiasm than usual as he takes the glass percolator back to the stove and does a little clog along the kitchen floor. He miscalculates and hits the front of the wood stove with a clang. Ma makes a deep gasp as she has run a Popular Club Plan at the mill to get this treasure. The percolator doesn’t break, but Ma tells him she will be glad to get them coffee any time they need it. She gives Dad the look that says if he had broken it, there would have been drastic action right there. I don’t participate in the hunting season at all. Shooting the .22 just once was enough for me and if we did not need the meat, I would hate to see the deer shot…that is just the way I am. It is morning and the hunters all gathered and left at daybreak. If Dad gets a deer, he will be home soon and we will all run to the car to see what he has. I know he shot a ten point buck once over behind Nick’s Point, he said. After he gets one, he goes up to Locke Mills and tags it and then he comes home and the others help him rope it up in the apple tree by our house. Within a few days, he dresses it and gives meat to all those in the hunting party. He always says who ever shoots a deer , must eat a piece of raw liver in the woods. Now I say that is gross and don’t believe that he makes them do it, but knowing my Dad and his wanting to be a frontiersman, maybe he does. I don’t know and don’t want to know. After he dresses it out, he drives what we call railroad spikes in the side of the house and it is so cold, he hangs the quarters on the spikes high enough so the neighborhood dogs cannot get to them. When we want meat for supper, Ma gets out the fry pan and he takes his hunting knife, goes out, cuts off slabs and brings them in to her. We don’t have electricity but the cold air keeps it frozen stiff. Dad can always tell by how the deer meat tastes whether it has eaten a lot of acorns or whatever deer eat. Sometimes he thinks it is a little bitter, but we eat it anyway. Ma made mincemeat once out of the neck and other pieces and that was delicious. The only time Ma gets upset is when she fixes Thanksgiving dinner and the boys and Dad are late in coming to eat. Sometimes they are on the track of a deer or seen one that has been wounded so they are tracking. Ma goes hunting once in awhile and is a good shot, they tell me. I guess I am the last hold out. I don’t think I can ever shoot an animal or even shoot a gun for fun. Curt says he thinks he will when he gets old enough. I tell him good, when I am old and married, he can bring me deer meat. He told me not to count on it. Well, fishing season and honey bee season is over, I guess Dad has to find something outdoors to keep him happy, and there is nothing that brings a big smile on his face than a dusting of tracking snow on a November morning. That is a good thing! 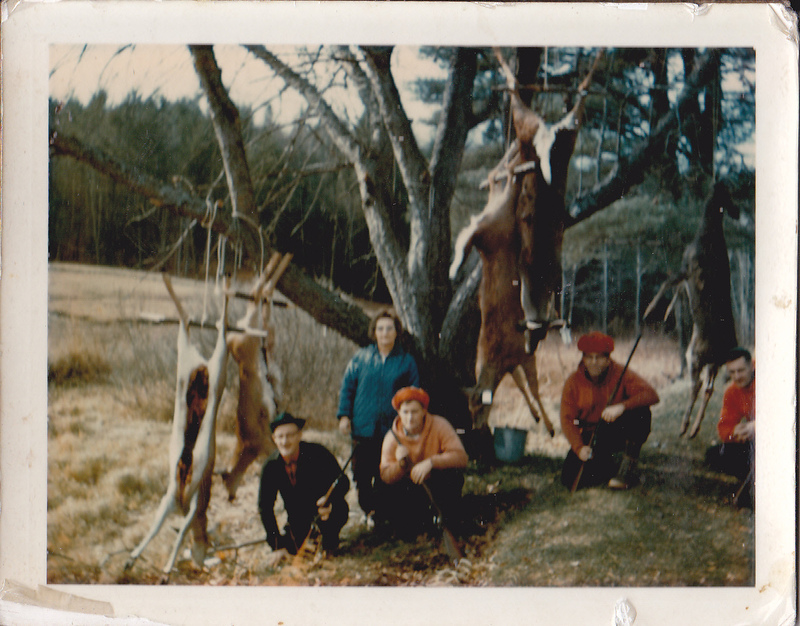 * Picture: L-R, Beryl,Ethel, Rex Martin, Joe Cole, Roland Martin with the five deer they shot one year..